I was on the phone with Mr Hu Bei, Deputy Director of Deyang (德阳) Educational Bureau, another county near the epicentre which has been devastated by the earthquake. One of his main concerns was how quickly they can rebuild schools for the estimated 30,000 school children survived the quake. He wanted to make sure the children would be able to resume they study as soon as possible, not to miss too many lessons. According to his estimate, the school rebuilding project would cost at least 3 billion RMB (about £220 millions, US$430 millions) in Deyang County alone. He also expressed the concern that the relief aids were not reaching the areas outside big towns quickly enough. 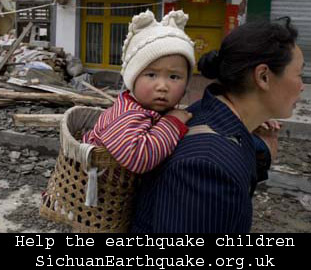 About 60-80% of collapsed houses are in the poor rural areas, where the children need more attention and care. This entry was posted on Monday, May 19th, 2008 at 2:47 pm	and is filed under Update. You can follow any responses to this entry through the RSS 2.0 feed. You can leave a response, or trackback from your own site.